Grace Mugabes PhD in Philosophy from the University of Zimbabwe, only months after being accepted in the course, has received international attention. Her husband and president of Zimbabwe, Robert Mugabe, has ruled the nation with an iron fist the last decades. He has been in power since 1980 and is also the head of the university. As a result, there have been widespread speculations concerning his role in awarding the degree. Grace received the PhD only months after her acceptance into the ruling party, ZANU-PF. Lately the party has suffered from inner conflicts and disagreements. Robert Mugabe turned 90 this year and multiple factions within the ruling party are now opposing each other, competing for positions and whickering over who is to become his successor. Many therefore suspect the PhD to be of a strategic character, aimed at strengthening Grace’s candidate. Winner of the Student Peace Prize in 2003, ZINASU, the largest student union in Zimbabwe have reacted strongly on the matter. After several appeals to the university and the Ministry of Education for an insight in Grace Mugabes thesis, all in vain, they have decided to take legal action against the university and what they claim is corruption. “We have decided to take the University of Zimbabwe to court and we will cite both the chancellor and the vice chancellor,” says Gilbert Mutubuki, president of ZINASU. The president being the head of the university, this effectively means they are putting the dictator on trial. Mutubuki also states that Grace’s PhD is an insult to all students in Zimbabwe. 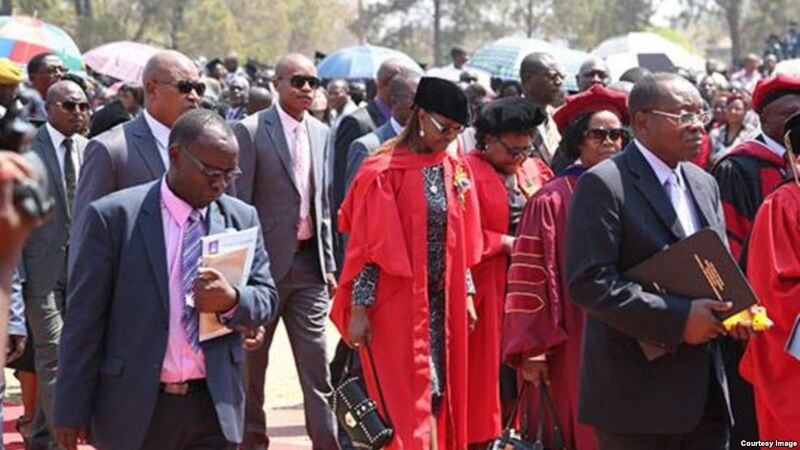 ZINASU said the degree awarded to Grace was “a serious insult to the students, the intelligentsia, doctors, professors and lectures associated with the University of Zimbabwe”. They argue that the PhD is a result of corruption and political ambition and wish to defend the integrity of education in Zimbabwe by taking a stand against corruption. “We believe no politician should use the university or its employees, as tools in their factional wars,” says Mutubuki. Mutubuki has received numerous threats form people close to Mugabe. They have warned him to stop pursuing the matter, and stop the trail. In addition, the university has threatened to expel him. In spite of this, the students stand firm “Intimidation will not stop us. Actually it motivates us because we want to see justice prevailing,” he said.